In November 2012 Kathlene and I had the privilege to form a tiny delegation from North Hertfordshire CAMRA to visit the Moor Beer Company in Somerset. The purpose of our visit: to present the “Beer of the Festival” award won by their beer Revival at the 2012 Letchworth Beer and Cider festival. As reported in the previous edition of Pints of View this is a light golden and hoppy beer at 3.8% ABV. Revival was notable from the moment I first broached the cask to be rewarded by a burst of intense aroma, it was like breathing hops. The beer won the festival by popular vote, obtaining twice the number of votes of the runners up. When you see the owl, you’re there. Given that Somerset is a bit of a trek from North Hertfordshire we arranged to visit the brewery on a Saturday and stay overnight in a nearby inn recommended by the brewery’s owner and head brewer, Justin Hawke. After checking into the inn we continued on to the brewery… and drove straight past the small side-road it’s on. Returning back eastwards we spotted the correct turn, there was a large road sign visible from the west but no matching sign to be seen from the east. Tricky! 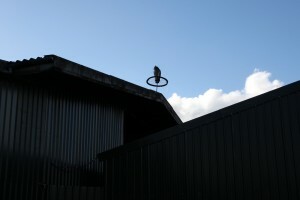 We were soon outside a large green farm shed, a wooden owl on a bicycle wheel atop, and us knocking on the brewery door. 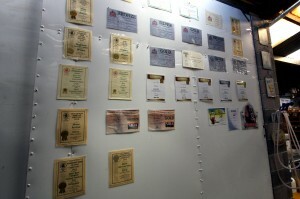 We were ushered to a corner to admire Moor’s wall of awards to keep us out of the way at first. A yeast transfer was taking place at the time and you need to be careful with your yeast! This gave us a good opportunity to study our surrounds. 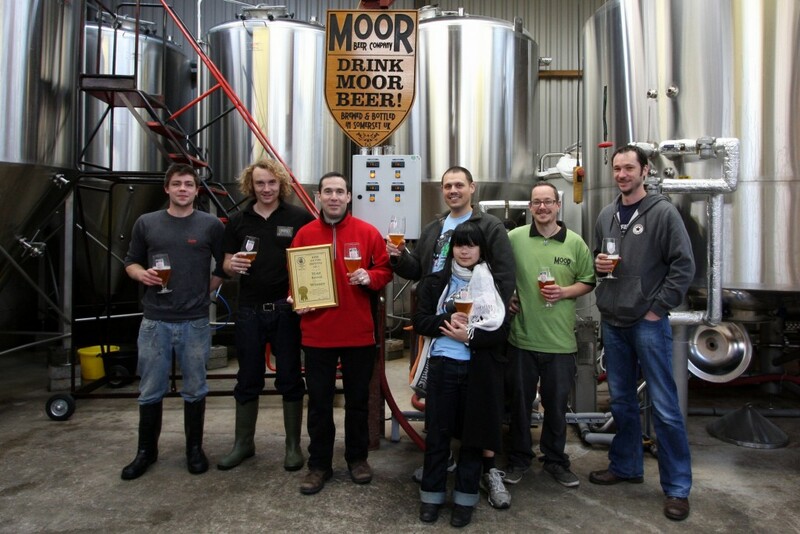 Moor is a typical example of a working brewery, all serious concrete and stainless steel. There is a scattering of pallets, boxes, kegs, and one luxury-item: a bottling machine. The yeast was soon safely dealt with and we were able to get the business of the award presentation and photography out of the way. We were then able to enjoy a few beer samples and have a good discussion with Justin, his staff, and a couple of local visitors. The topic, unsurprisingly, was beer — but in particular Justin’s strongly held views on matter of good beer. Justin prefers to make, sell, and drink what he calls natural beer and doesn’t like using finings in his cask ales. These “finings” we’re talking about here are a chemical substance derived from certain types of fish which is added to cask ales to help them clear faster and brighter. The action of finings is to make yeast in the beer clump up and sink to the bottom of the barrel. The primary problem most people have with finings is that their use makes cask ale unacceptable to strict vegetarians. However Justin doesn’t believe leaving finings out is good only for vegetarians, but that it also makes the beer more flavoursome and enjoyable. Flavour components, especially hop oils, stick to small particles that are pulled down to the bottom of the barrel and thus out of your pint of beer. I have heard others counter that the haze can also carry undesirable flavours and I suspect that this is an argument that could go on for quite some time. At the end of the day the truth is in the mouth of the beer drinker. I tasted Justin’s cask ales in unfined-form at our excellent inn, the Queen’s Arms in Cortham Denham, and can very much say that the ale was in incredibly fine form. There was a slight haze to the beer, enough to put a frown on the face of many cask ale drinkers even though the beer tastes perfectly good. This, I think, is where the battle-lines lie for unfined ales: the culture of cask ale is one where a beer will not usually be considered perfect unless it is crystal-clear. This may change over time as awareness grows, it may also be aided by the growing popularity of more heavily hopped IPAs. These strong and very hoppy ales tend to carry a “hop haze” irrespective of whether they’re fined or not. Bottled Moor beers are available online through West Country Ales, who have a shop-front in the picturesque Cheddar Gorge. Fred Wilde, shop owner, was at the presentation and we visited his shop the next day to find a great selection of beers. Beaut Cheddar cheddar from across the road, and great west country ale… perfect. You can order Moor beers online here: http://www.westcountryales.co.uk/ — follow Fred on Twitter: @westcountryales. If you run a pub or beer festival, we bought our Moor “Revival” from one of London’s newer beer distribution companies: Liberty Beer, they don’t currently have any regular deliveries within Hertfordshire but may be able to arrange something for you if you get in touch: http://libertybeer.co.uk/ — they’re on Twitter too: @liberty_beer. This entry was posted in "Real Ale", Beer Festival, Brewery, CAMRA, Road Trip and tagged Beer of the Festival, Letchworth, Moor Beer, North Hertfordshire, Revival, Somerset by Yvan Seth. Bookmark the permalink. Nice write up, great brewery in a lovely part of the country. Being a vegetarian, I’m all for unfined ales, and as something of a hophead, I actively seek out beers with a hop haze! I wasn’t aware that hop oils stuck to the fining particles and are therefore removed from the beer – that makes me even more determined to support unfined ales! Good work getting Revival to the Letchworth beer fest last year too, it was in cracking form – hope the fest returns this year and brings more Moor with it.